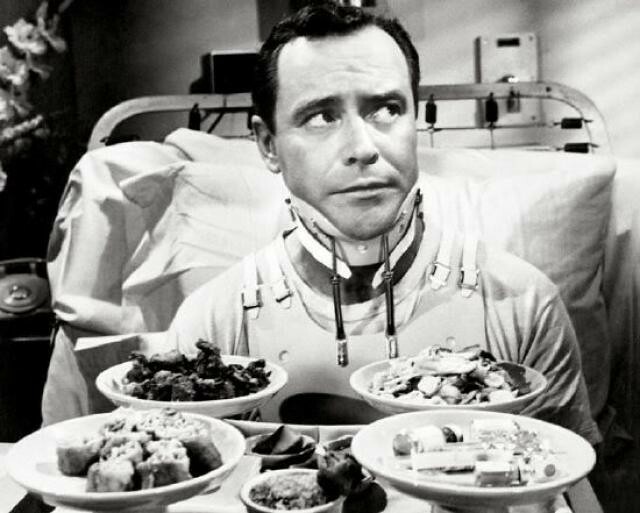 Today, I'm looking at director Billy Wilder's classic comedy, The Fortune Cookie (1966), starring Jack Lemmon (above) as a man who is faking a spinal injury for a large insurance settlement. This article is part of the Billy Wilder Blogathon hosted by Outspoken & Freckled and Once Upon a Screen. Go here, for more articles about one of America's greatest filmmakers. 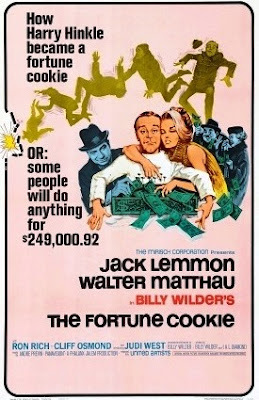 The Fortune Cookie (1966) isn't one of Billy Wilder's better known films. Wilder himself, called the movie "the beginning of my decline" in an interview with filmmaker Cameron Crowe, and the critics were somewhat mixed on the film's virtues (The New York Times critic Vincent Canby praised the movie's humor, but he suggested that perhaps Wilder and his co-screenwriter I. A. L. Diamond had run out of ideas). The Fortune Cookie does have its flaws, like the harsh treatment of the female characters and an overly sentimental ending, but the movie is still a sharply funny look at American life that reveals quite a lot about Wilder's cinematic obsessions. The Fortune Cookie begins when cameraman Harry Hinkle (Jack Lemmon in full nervous Nellie mode) is accidentally knocked over by the star running back (Ron Rich) while working at a Cleveland Browns game. Harry is only slightly banged up, but his brother-in-law is Cleveland's leading ambulance chasing lawyer, "Whiplash Willie" Gingrich (Walter Matthau in a bravura performance that earned him a Best Supporting Actor Oscar). Willie wants Harry to fake a spinal injury so they can collect a large insurance settlement. Harry reluctantly goes along in the hopes that some fast cash will bring his straying ex-wife (Judi West) back into his arms. A vintage poster for The Fortune Cookie (1966). The Fortune Cookie is one of Wilder's funniest movies, mostly because of the chemistry between Lemmon and Matthau. This was their first film together; they would go on to co-star in nine more movies, including two with Wilder (The Front Page and Buddy Buddy). Lemmon, who is an underrated physical comedian, conveys quite a bit of Harry's inner turmoil by fidgeting and squirming in his neck brace and wheelchair. His best moment in the movie is his dance in a wheelchair when he finds out his ex-wife is coming home. 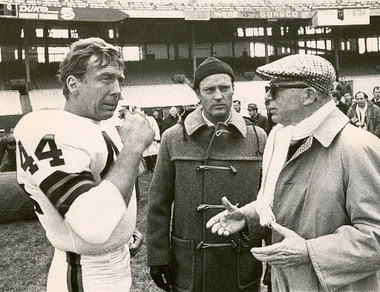 Director Billy Wilder (right) talks with the stuntmen doubling for Ron Rich (in Browns uniform) and Jack Lemmon while filming the opening scene of The Fortune Cookie (1966) in Cleveland Municipal Stadium. As great as Lemmon is, The Fortune Cookie is Matthau's show. Matthau was a successful stage actor who appeared as a heavy in a few films before Wilder handed him the plum role of the scheming legal eagle. Matthau's performance is a work of genius: Whiplash Willie is one of the screen's great fast-talking shysters right up there with Groucho Marx as Rufus T. Firefly. 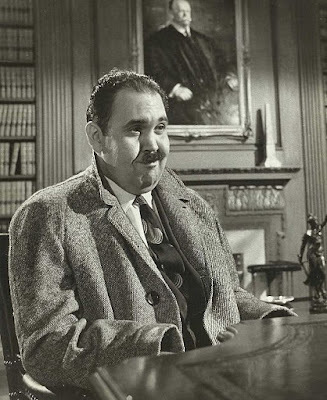 Willie has a unique moral compass (he convinces Harry to go along with his scheme because "insurance companies have so much money they put it on microfilm") and he judges everyone by his own dubious set of standards. Willie's take on Abraham Lincoln: "Great president, lousy lawyer." The clip belows explains the movie's title and it's also a great Matthau moment. Matthau's larger than life performance sometimes disrupts the rest of the movie. Lemmon astutely observed in Ed Sikov's Wilder biography that The Fortune Cookie "died" every time Matthau was off screen. In many respects, he's right. Judi West is a fine actress, but her character is so money hungry that she turns off the audience, and poor Ron Rich, who is the only kind-hearted soul in the entire movie, basically ends up as Lemmon's servant. 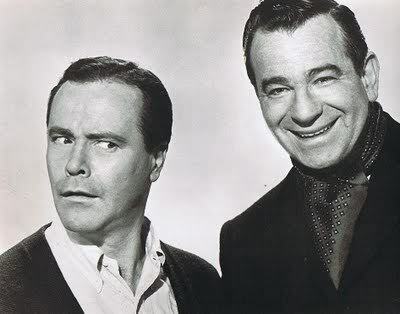 Jack Lemmon (left) and Walter Matthau in a publicity still for The Fortune Cookie (1966). Like many of Wilder's films, The Fortune Cookie deals with the themes of love and money or, more specifically, how money can buy you love or at least a pretty decent imitation of it. In Double Indemnity (1944), Walter Neff (Fred MacMurray) lures Phyllis Dietrichson (Barbara Stanwyck) with the promise of a life insurance payoff, and Norma Desmond (Gloria Swanson) keeps Joe Gillis (William Holden) on the string with cigarettes and camel hair suits in Sunset Boulevard (1950). In much the same way, Harry lures his ex-wife back to his dingy apartment with the promise of $1 million. Cliff Osmond plays a private detective who is shadowing Harry Hinkle in The Fortune Cookie (1966). The Fortune Cookie receives a lot of criticism for its harsh tone, and while there are some mean jokes (most of them directed at West), I think Wilder's observations about human nature are fairly accurate. While Frank Capra, another European immigrant who became an old Hollywood auteur, celebrated the best in our democracy, Wilder deals with the darker elements of American culture. In his interviews with Crowe, Wilder recalled that when he first came to Hollywood he noticed how much Americans talked about money. The quest for the almighty dollar is a driving theme in Wilder's work, whether its Walter and Phyllis planning a murder in Double Indemnity or Whiplash Willie planning to sue the United Fruit Company because they don't have warning labels on their banana peels. The Fortune Cookie's trailer is below and the opening catchphrase nicely sums up Wilder's screen philosphy. The Fortune Cookie is available on DVD. Wonderful blog! My only real quibble with the movie was the sentimentalization of the friendship between Harry and the running back (which you touched upon), so I agreed with most of your review. And I *certainly* agree that it was Walter Matthau's show all the way. Terrific critique! Thanks! I've watched the first 45 minutes of this movie several times because Matthau is so hilarious, but it does go downhill after that. I love the super dark humor of this film- completely Wilder! Great review, Amanda! Thanks for joining our bday bash! Thanks for co-hosting the blogathon. It was a lot of fun. I've seen this movie several times and Matthau never gets old. Thanks for co-hosting the blogathon!